An Ex Citizen’s Guide to Divorcing the U.S.A.
Maybe you are worried about the fragile state of the economy in America. After all, our supposed “recovery” is marked by soaring unemployment, massive government debt – and most of the same problems that caused the last crash continue to linger. Or maybe you've just had it with being treated as a piggy bank for the social program du jour. Social Security, Medicare, Medicaid, Welfare, Workfare are all broken and bleeding money, and taxes are going to rise substantially. Whatever your reason for considering to escape to greener pastures, it is not a decision that should be made rashly or lightly. Whether you simply want a second passport, “just in case,” or want to jump ship for good, it requires preparation and guidance. 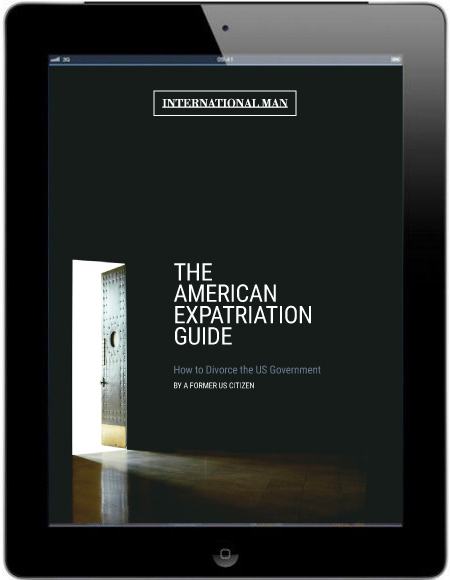 For that reason, we urge you read this FREE Special Report, American Expatriation Guide – How to Divorce the U.S. Government. It's a complete handbook on expatriation, compiled by a former U.S. citizen – guiding you through the process of expatriation in amazing detail. Just enter your email address below, and we'll rush you your FREE copy. Submit your email for your free report and as a bonus, you’ll also receive our wildly popular read, International Man Communiqué.